It’s probably strange, given my obsession with carrot cake, that I haven’t actually shared a recipe for carrot cake with you yet. I’ll work on that. In the meantime, I’m making every other kind of baked good into a carrot cake hybrid to feed my inability to leave well enough alone. 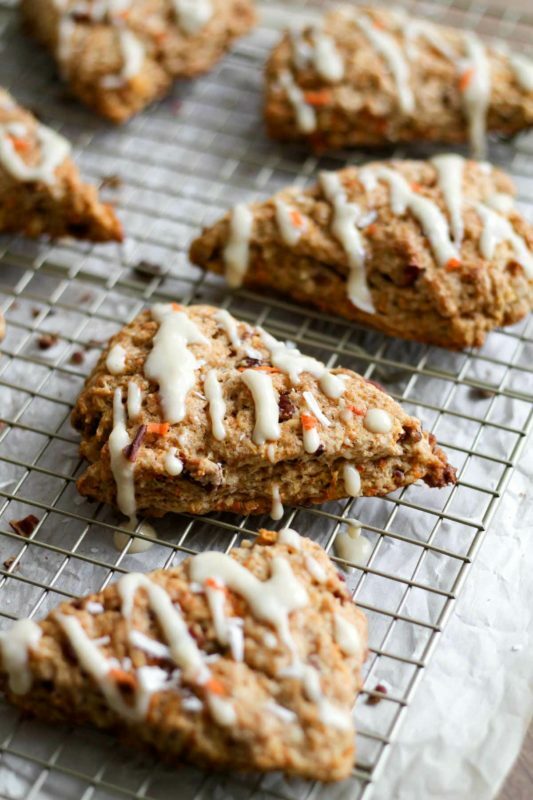 We started with carrot cake cinnamon rolls, and now…carrot cake scones. I’ve always loved carrot cake. 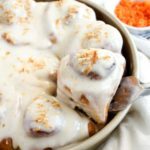 There’s something about it that’s so cozy and comforting – the warm spices, the flecks of carrot, the brown sugar, the contrast of the tangy, soft cream cheese frosting. I remember a bakery we used to go to when I was little sold tall slices of carrot cake with the bright orange buttercream carrots piped on top, and I thought there could be nothing better in life. Well, they also had cinnamon sugar donuts, so maybe I’m being a tad unfair. No one should have to choose between cake and donuts. We usually chose both. Brian and I had carrot cake as one of the tiers of our wedding cake, and we loved it so much that we saved that tier for ourselves. We ate it in our hotel room after the reception, still in our wedding garb. That’s dedication. The other two flavors weren’t bad: vanilla cake with raspberry filling, yellow cake with lemon filling. But the carrot cake stole the show for us. So when Rebecca and Ruth from Square Meal Round Table reached out about a recipe collaboration featuring carrots as the star ingredient, I jumped at the chance to revisit my favorite savory-turned-sweet vegetable. 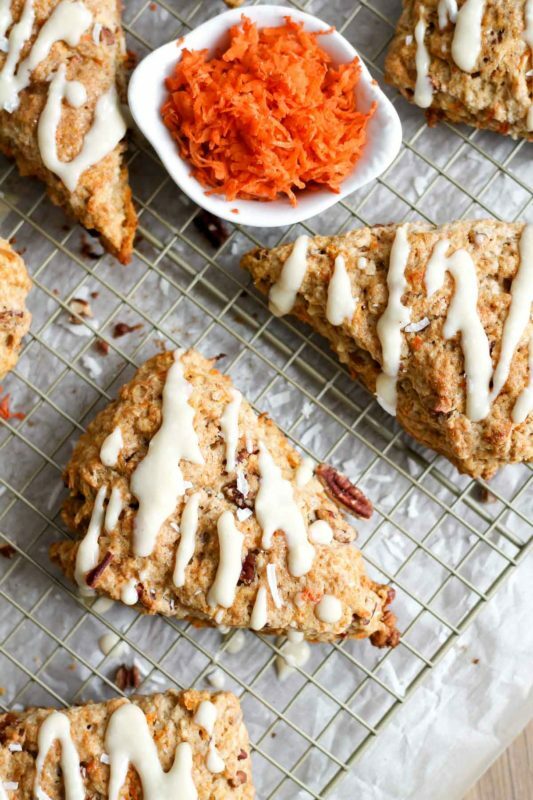 A whole group of talented bloggers created new recipes featuring the humble carrot, and I have to say, the results look pretty spectacular! You can find all the photos on Instagram by searching the hashtag #24carrotgoals. 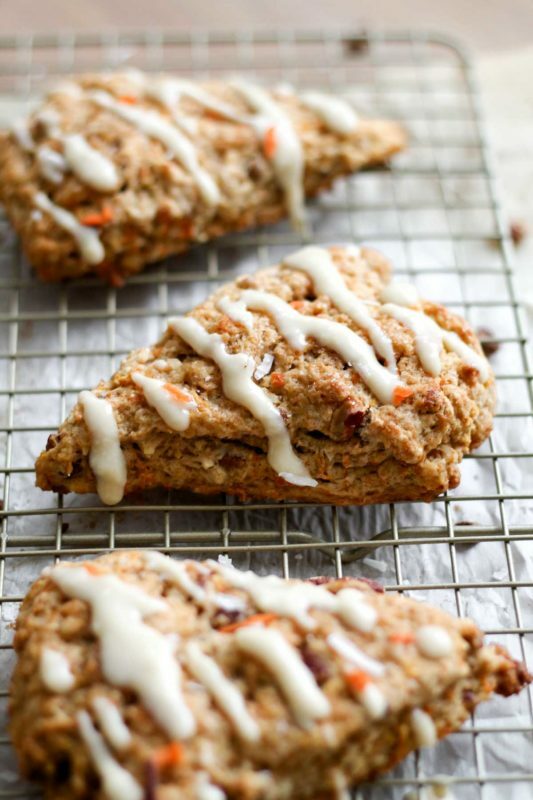 So let’s talk about these carrot cake scones. 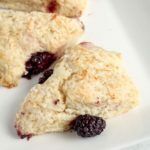 I adapted these from my recipe for Blackberry Coconut Scones. In that recipe, I made the scones vegan by using coconut oil instead of the traditional butter, and canned coconut cream instead of heavy cream. 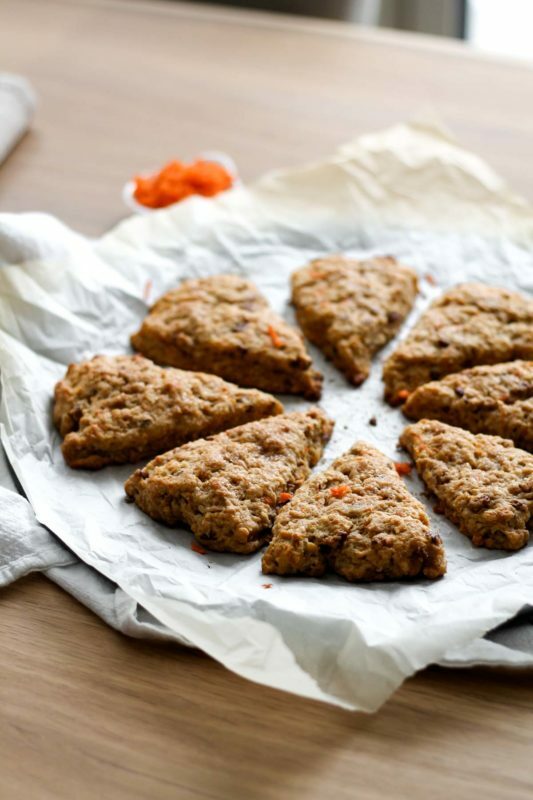 The result was spectacular – tender, flaky, perfectly soft yet crisp scones. I actually found that I liked the way the coconut oil cut into the flour much better than cold butter – it’s much more even, and MUCH faster. 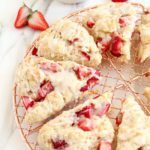 If you need step by step photos for mixing and shaping scones, go check out that recipe. 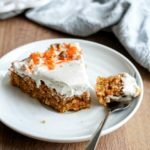 I thought coconut oil and cream would work well here, since coconut is so often paired with carrot cake. The two were basically made for each other. So I tweaked a bit, using brown sugar instead of white and adding carrots, pecans and those classic cinnamon and nutmeg spices for the smell and taste of carrot cake. Don’t be mad, but for the best texture, I really do recommend hand-grating the carrots. It’s only one cup and if you have a box grater, it doesn’t take all that long. I know, I know. The things we do for love. Of course, you can’t forget the cream cheese glaze. The tang of it sets off the sweetness of the carrot. It’s indispensable. I made it simple here, too – just cream cheese and maple syrup. I choose to use a glaze rather than a thick frosting, as scones don’t need much garnish in my opinion. Plus, we’re eating these for breakfast, so I try to maintain at least a modicum of propriety. It just means I can eat two. I hope you try these and love them! Please comment and let me know if you do. Happy carrot-ing! 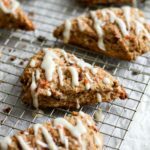 Have carrot cake for breakfast with these tender, spiced carrot cake scones, finished with a tangy cream cheese glaze. Preheat your oven to 400 degrees F. In a large bowl, whisk together flour, brown sugar, baking powder, salt, cinnamon, and nutmeg. Add the coconut oil and cut it into the flour mixture with a fork. The motion is like scraping it down into the center of the bowl over and over. Stop when the mixture resembles wet sand. Stir in the carrots, pecans, and coconut. Pour in the coconut cream and stir gently until a shaggy dough is formed. Turn the dough out onto a floured surface and pat it into a 1-inch thick disk. With a bench scraper or a very sharp knife, cut the dough into 8 even wedges. Arrange the wedges on a baking sheet lined with parchment paper. Brush a little coconut cream over the tops of the scones and sprinkle with coarse or turbinado sugar if desired - this part is totally optional, but delicious. If you have time, place the baking sheet in the freezer for 10 minutes or in the fridge for a half hour before baking. It isn't absolutely necessary, but it helps the scones keep their shape and keeps them flaky and tender. 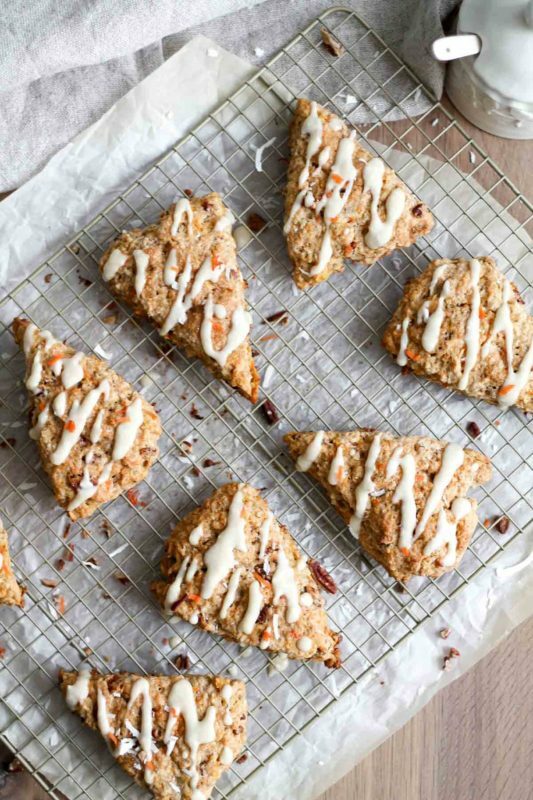 Bake scones for 17-18 minutes, until they are just beginning to brown and smell delicious. Drizzle with the cream cheese glaze and serve! In a small bowl, whisk together cream cheese, maple syrup, and salt, until a thick but pourable consistency. *I find that hand-shredding the carrots leads to the best texture. I know, it's annoying - but if you have a box grater it doesn't take too long. 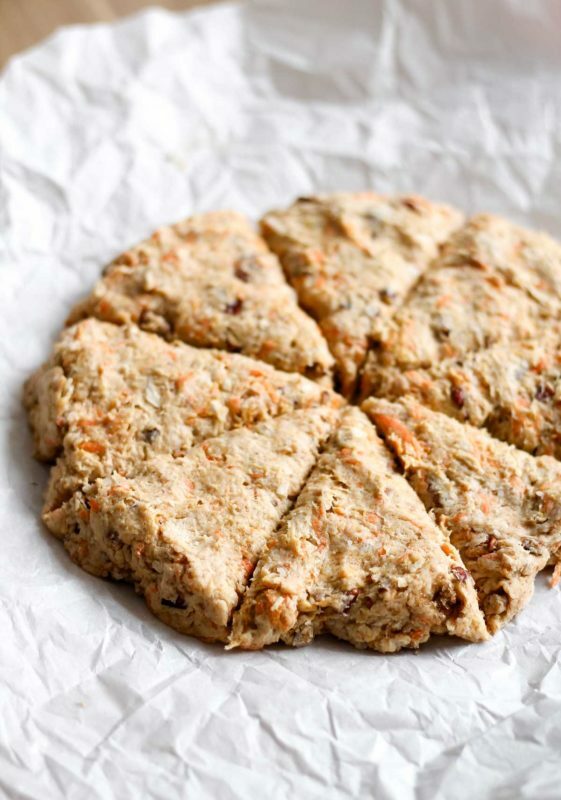 You can also use a food processor, but make sure the carrots get shredded very finely or else they will still be crunchy after the scones are baked. Scones are best the day they're made, but will keep, covered tightly in the refrigerator, for 2-3 days. Recipe adapted from my Blackberry Coconut Scones. I made these the other day and used heavy cream and they were fantastic! I’m actually making them again today using coconut cream for my family coming in for Easter!